Sen. John McCain (R-Ariz.) is reportedly returning to Arizona and will miss the final vote on his party’s tax bill this week. McCain, who has been hospitalized at Walter Reed Medical Center suffering from the side effects of his treatment for brain cancer, left Washington, D.C., on Sunday to return home for the holidays, CBS News reported Sunday. This means he will not be in D.C. for the GOP tax bill vote, which is expected to take place early in the week. Republicans have won over two key votes for the measure, meaning they should still have the razor-thin majority needed to pass the bill. Let's keep trying. It's not over until it's over. Audubon (Society) Action Center link for Congress. - setting up the prospect of long-term political risks, said Larry Persily, a former federal pipeline official in the Obama administration. - A new administration and Congress in 2021 could take steps to stop development, he said. "Alaskans shouldn't start counting the barrels yet," Persily said. ME: My quite protest is to change my party affliction from Independent to Democrat. I voted straight GOP in last election and look what I got, bamboozled. Independent Alaska oil and gas lease investors Daniel K. Donkel and Samuel H. Cade won the rights to key leases of an oil discovery that may extend far into the Arctic National Wildlife Refuge. Donkel and Cade – owners of Donkel Oil and Gas LLC – won seven of the 16 leases that received bids in the Alaska Beaufort Sea Areawide competitive oil and gas lease sale held Dec. 6 in Anchorage. The leases bolster Donkel's position in the Stinson oil and gas prospect located in the Beaufort Sea contiguous to the 1002 area of ANWR and Exxon's Point Thomson development. Oil was discovered with the Stinson #1 well in 1990 by ARCO. Donkel and Cade have assembled an attractive block of leases surrounding the discovery well. A February 23, 2010 PetroTechnical Resources Alaska report by petroleum engineer Michael D. Dunn of, suggested reserves of between 80 and 420 million barrels, with a base case reserve of 150 million barrels. Geologic Survey estimates lie below and around ANWR in the 1002 Area. if we drill our prospect offshore from state waters and drain the onshore 1002 area of ANWR,"
(1 of 5 Comments) Please read the interesting comments on the link below. T.Y. The Arctic National Wildlife Refuge is one of the most prolific bird nurseries on the planet, but it’s in jeopardy. It's not too late to take action to protect this pristine habitat. "Sen. Lisa Murkowski should know the Stinson oil discovery prospect by Donkel and Cade could have oil revenues in the government's hands in less than two years if we drill our prospect offshore from state waters and drain the onshore 1002 area of ANWR, see link, http://www.prweb.com/releases/2017/12/prweb14992471.htm"
IT IS HARD to say what is most damning about the process Republicans used to produce their $1.5 trillion overhaul of the tax code. Is it the suggestion by critics that a key senator dropped his opposition because of a last-minute change that would benefit him personally? Or is it his defense that the provision didn’t influence his support for the legislation because he never actually read the entire bill before changing his position? 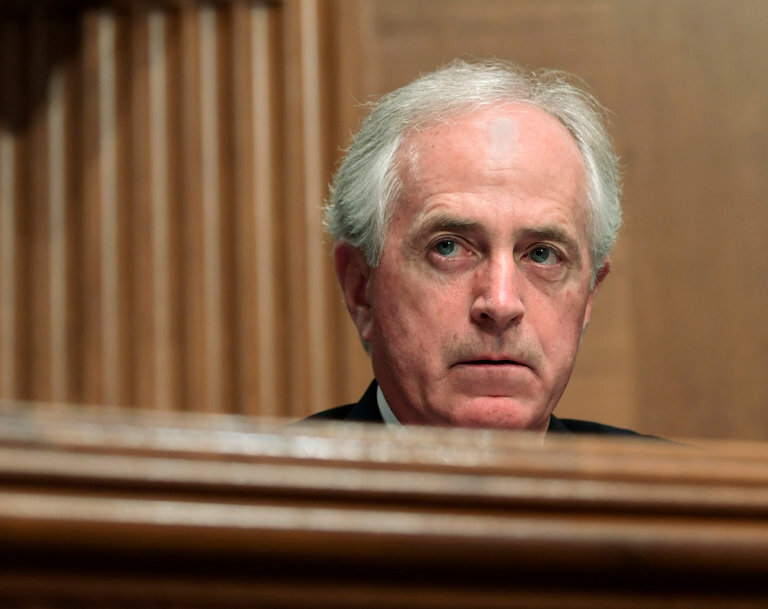 The kerfuffle that followed the announcement by Sen. Bob Corker (R-Tenn.) that he would vote for the tax bill when it comes up for a vote this week underscores the unseemly way legislation of such consequence has been cobbled together behind closed doors and with Democrats completely shut out. And the fact that real estate businesses would get a hefty tax break from the provision in question is further evidence of just how much the GOP bill tilts toward the wealthy. ME: Oh, isn't Senator Corker, suppose to protect the American people? or his real estate? Just a question. We can't vote Corker out of office because he is not running in 2018. Sen. Marco Rubio (R-Fla.) will support the GOP's tax bill now that the child tax credit has been expanded. Rubio is telling colleagues he is a "yes" on the bill after having threatened to vote against it on Thursday, a source told The Hill. Next Meeting: Dec. 19, 2017 at 9:00 a.m.
Next Meeting: Dec. 19, 2017 at 10:00 a.m. The Senate Meets for a period of morning business, with senators permitted to speak in any topic. ME: Mr. Donkel saying that he is going to drain the onshore 1002 of ANWR? ME: WSJ is reporting live updates. - The House likely to vote by 2 p.m. today, the Senate’s action will clear the last hurdle on the bill and send it to President Donald Trump’s desk. - The Senate will vote on the tax bill “later this evening,” Majority Leader Mitch McConnell (R., Ky.) said as the chamber opened this morning. The less innocent explanation is that Corker changed his vote from no to yes last week because his colleagues inserted a real-estate provision that will personally benefit him. This notion led to the talk of a #CorkerKickback on social media. Corker is retiring from the Senate after this term, in part, it seems, because he is disturbed by Trump’s behavior as president. His retirement from politics could have freed him to vote his conscience. Instead, he’s violating his own principles, or at least what he calls his principles. It’s sad, and it’s damaging to the country. But, hey, at least he will be even more financially comfortable in retirement. There are few places left on the planet that remain unscathed by the heavy footprint of humanity. The 19.6-million-acre Arctic National Wildlife Refuge, in the northeast corner of Alaska, is one of them—a vast primordial wilderness that stretches from spruce forests in the south, over the jagged Brooks Range, onto gently sloping wetlands that flow into the ice-curdled Beaufort Sea. ANWR is the summer breeding ground of nearly 200,000 caribou, the winter den of dozens of polar bears, and the gathering place of millions of migratory birds that descend upon it each spring from every flyway in North America. Now it may soon be home to oil wells, gravel roads, air strips, oil camps, and all the infrastructure they entail. "The numbers don't add up whatsoever," says Jamie Williams, president of The Wilderness Society, whose predecessor, the legendary field biologist Olaus Murie, helped draw the boundaries of ANWR’s predecessor, the Alaska Wildlife Range, in the 1950s. "The whole notion that you are going to trim a trillion-dollar deficit with phony oil revenue is just a cynical political ploy. This is a backdoor gimmick done in the dark of the night to achieve a political goal at the expense of a place this country has protected for half a century. The majority of Americans don't want to see ANWR industrialized." but I they will make me smarter. Thank-you to everyone who tried to make a difference, I'm sure that we did. It just was not the outcome that we hoped for. Perhaps in the long run, something positive will come from this defeat. For now I need a prayer. St. Francis is the patron saint of animals, so I hope he will help. What is Saint Francis the patron saint of? St. Francis cared for the poor and sick, he preached sermons to animals, and praised all creatures as brothers and sisters under God. St. Francis of Assisi, patron saint of animals and ecology, was born in Italy around 1181 or 1182. The American people do not want our fragile coastal waters exposed to dangerous oil and gas drilling. Yet your administration is pushing a new five-year offshore plan that would allow drill rigs to put virtually every inch of our nation’s coastline at risk of devastating oil spills. It’s unconscionable, and it must be stopped. ME: Thank-you for your time.